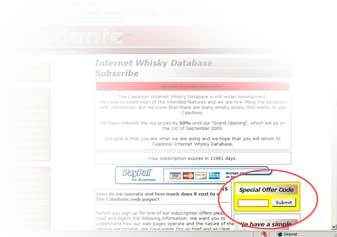 This email adress will be your username at Caledonic Internet Whisky Database. It's important that you can receive emails to this account during the registration, since a password will be sent to it. Choose the "I have no acount but wish to create one" option and click the "Continue" button. 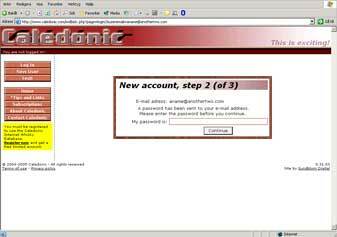 A new password has been sent to the email address you entered. 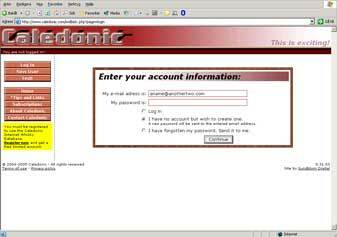 Check your email for an email from Caledonic. Use the password found in that email and enter it here. Save this password! You can change it later if you want. Caledonic Internet Whisky Database contains alot of information about alcoholic beverages. Because of that we are forced to ensure that you are of legal age and who you are. At the bottom you can change your password. All fields marked with an asterisk (*) is manatory. 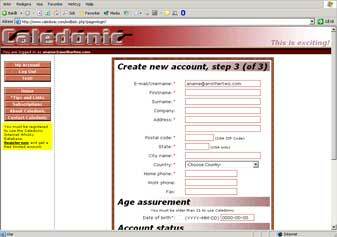 Caledonic does not and will never sell, or give away, your internet details to anybody. 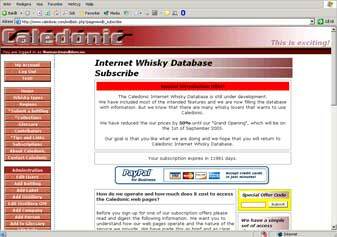 Caledonic Internet Whisky Database is a subscription led service. We do not sell advertising space on our pages to other companies. Caledonic does not accept payments from other companies or third parties for information given on our web pages and we not do we seek such payments. NOTE: Before you choose your subscription you can take a free limited peek at the database. In case you have received a Special Offer Code you should enter that code in the yellow area instead of choosing a subscription.